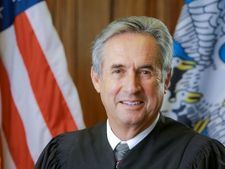 James T. Genovese, known as Jimmy Genovese (born August 24, 1949), is one of the seven justices of the Louisiana Supreme Court, which convenes in New Orleans, Louisiana. Running as a Republican from Opelousas in St. Landry Parish in south Louisiana, he was first elected to the court for a ten-year term on November 8, 2016, to succeed the retiring Democrat Jeannette Theriot Knoll of Marksville in Avoyelles Parish south of Alexandria. To win his seat on the high court, Genovese narrowly defeated Marilyn Carr Castle (born January 2, 1953), a 15th Judicial District Court judge from Lafayette, 133,389 (50.9 percent) to 128,598 (49.1 percent). Genovese studied at the Academy of the Immaculate Conception in Opelousas and in 1971 graduated from Northwestern State University in Natchitoches, Louisiana. In 1974, he received his Juris Doctorate from the Loyola University College of Law in New Orleans. On November 2, 2004, he was elected as a Democrat to the Louisiana Third Circuit Court of Appeal, Division B, based in Lake Charles, on which he served from January 1, 2005, until his swearing in for the Supreme Court seat on January 1, 2017. In the 2004 contest, he defeated a Republican candidate, Paul deMahy, 82 to 18 percent. He ran unopposed for another ten-year term on the circuit court in 2014. From 1995 to 2004, he was a Democratic judge for the 27th Judicial District. On February 15, 2018, the Louisiana Secretary of State listed Genovese as a "No Party" voter. He presumably defected from the Republican Party after his election to the Supreme Court. ↑ James Genovese. Mylife.com (February 15, 2018). ↑ Marilyn Castle. Mylife.com. Retrieved on February 15, 2018. ↑ 3.0 3.1 James Genovese - Ballotpedia. Ballotpedia.org. Retrieved on February 15, 2018. ↑ Election Returns. Louisiana Secretary of State (November 2, 2004). Retrieved on February 15, 2018. ↑ James Genovese 70570 August 1949. Louisiana Secretary of State. Retrieved on February 15, 2018. This page was last modified on 21 June 2018, at 06:10.